The first ever Eco Fashion Week took place this year from November 23rd - November 28th in Fremantle, Perth and tommie had the privilege of attending and covering the event as an official media partner. What a a way to end the year and roll into 2018 with the promise that eco fashion is well on its way to becoming mainstream, with a whole week dedicated to it in our very own backyard - Australia. For those that follow along and read our 'creative women with a conscience' series, you'd know that the event was the brainchild of Zuhal Kuvan Mills - read our exclusive feature to learn more about her. Not only was EFWA 17 instrumental because it brought to the lime light an array of International and local designers whose collections challenged the status quo with their sustainable fibres, upcycling skills and artisan techniques - but it also addressed the issues of diversity in fashion with a multicultural approach to model casting. Something we have wanted to see change in the Fashion Industry for too long now, and was embraced on the runway. Here's what we got up to in our week visiting the city of Perth, WA - our favourite collections and the outfits I wore to the shows. If you follow along our tommie eco travel guides, you'll know that we always choose to stay in airbnb homes - there was nothing different about our stay in Perth when we visited for EFWA17. We stayed in the lovely seaside suburb of Cottesloe in a an actual treehouse - yes you heard correct! Made from second hand, salvaged materials we couldn't have picked a more perfect place that aligned with our values. The exterior - painted in a bright yellow, decorated with fairy lights and positioned under a bottle brush tree. The interior - with bohemian and traditional Indian textile accents sourced from the owners travels, inspirational 'coming of age' second hand books and beautiful fabric canopy surrounding the bed. The treehouse faces a view of the pool and an outdoor shower - and can we say, you haven't showered until you've done so underneath the trees with the birds chirping, the wind kissing your skin and the sun beaming on your body. It is close to Cottesloe beach, public transport, cafes and supermarkets - so if you want offset some of your carbon footprint, this is the ideal accomodation to get around on foot, public transport or bicycle, without having to hire a care. This was a magical stay, one we highly recommend! All of the outfits worn to the shows were vintage and second pieces sourced from thrift stores, vintage shops or flea markets. The only piece which was purchased 'new' was the pink, polka dot skirt which is by an Australian brand made locally in Sydney, Australia, as well as the Patsy Cline brooch hand made and illustrated by, Kirbee Lawler - both of which I've worn well over 30 wears. As you can see I only wore two different pairs of shoes for all of the eco fashion week events - proving that you can can mix and match different outfit co-ordinations and wear the same accessories! Some of the pieces - for example the daisy duster and the white 60's dress - are both items from the 'tommie shop'. An online, curated space with pieces that have been hand sourced by myself - all quality vintage and second hand items. We had the privilege of speaking with Zuhal Kuvan Mills before Eco Fashion Week kicked off - the designer of 'Green Embassy' the label, as well as the founder of Eco Fashion Week Australia. If you'd like to read our in depth feature, you can view it in our 'creative women with a conscience' series here. Zuhal is a true ecopreneur, environmental activist and slow clothing ambassador on a mission to change the way we see fashion, with a conversationalist approach to her designs clearly evident in her EFWA collection entitled 'Empty Oceans'. She portrayed the delicate beauty of our oceans with her floaty and feminine structures, whilst juxtaposing this with the reminder that our oceans have become a fragile space in nature with it's health and survival in jeopardy. The collection was made with regenerated polyester from ghost fishing nets, a result of industrial scale fishing. The nets were seen throughout the EFWA debut, styled as accessories like stockings, bows and wrapped around the wrists of models; perhaps symbolic of how threatening these nets can be to marine life? An especially beautiful runway representation as she not only showcased haute couture designs and structures, but delivered this with substance and integrity through her environmental statement and visual stimulus. Empty Oceans is a poetic expression and story of mother nature, and how our oceans are the ultimate life force imperative to our survival as humans. Through care, respect and conservation we can change the health of this eco system which currently is in danger. Lima Jordon's collection was definitely one of our favourites of the week. We admire and respect designers who use clothing to communicate messages of equality, diversity, unity and tradition. Aboriginal heritage and culture was a clear inspiration for Lima with rich and warm tones used in her design colour palette, alongside the poetic dedication to nature and the environment, with leaves being tossed in the air and celebrated. Lima's respect for indigenous tradition and the qualities it presents when it comes to seeking identity, personal discovery and the concept of the 'unknown' were evident in the collection. She celebrates the flaws of human kind and uses this idea of 'imperfection' and 'identity' in her designs by incorporating pieces that focus on versatility though layering - we learn through her work that our identity is limitless, yet bountiful, as there is no prescription on individuality. We as humans are a work in progress, constantly evolving and changing. A dedication to more primitive and nomadic ways serve as a form of education in sustainable living and a respect for the land. She also acknowledges and celebrates beauty through her diverse representation of female models on the catwalk - a break through for Australian Fashion! 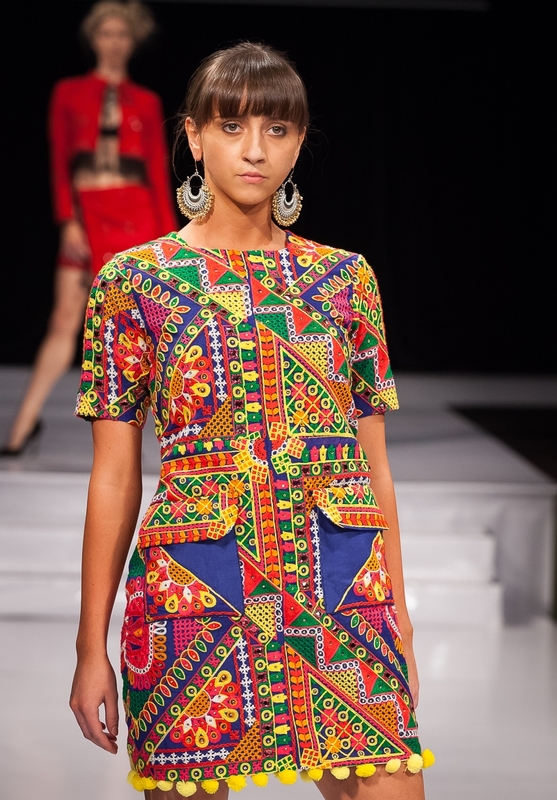 An incorporation of heritage and modernity - this collection by Sonalika Pradhan fuses colour, technique, pattern and cultural tradition all into one. With statement styles, artisan skills and craftsmanship - inspired by the designers Indian ethnicity - Sonalika explores sustainability through customisation by creating one of a kind garments - using organic silk, cotton and khadi to demonstrate individuality and style, rather than trends and fashion. Designer Claudi, a Curtin University graduate, is the real deal when it comes to up-cycling and using what already exists in the world to create new designs. She up-cycles bedding materials, alongside re-constructing jeans to create cool, new looks that use artisanal skills like the Japanese BORO technique. Her collection 'ROOTS', which was her EFWA17 debut collection, signifies her values as a designer - edgy, raw, honest and alternative. She also challenges traditional gender stereotypes and uses her pieces to make statements like the ones we saw on the runway, 'Boys Will be Girls, and Girls Will be Boys'. "As a designer, I work to help the crafts community in my country, Indonesia, through designs, marketing, creating direct links between the sellers of raw materials and buyers and reintroducing the use of natural materials available where the artisans live to create dyes We also encourage them to grow plants that can be used in dyes, medicine, spices, and ritual ingredients that preserve their ancestral culture. Growing these plants will also help green their environment". Merdi Simombing for eco fashion week australia. 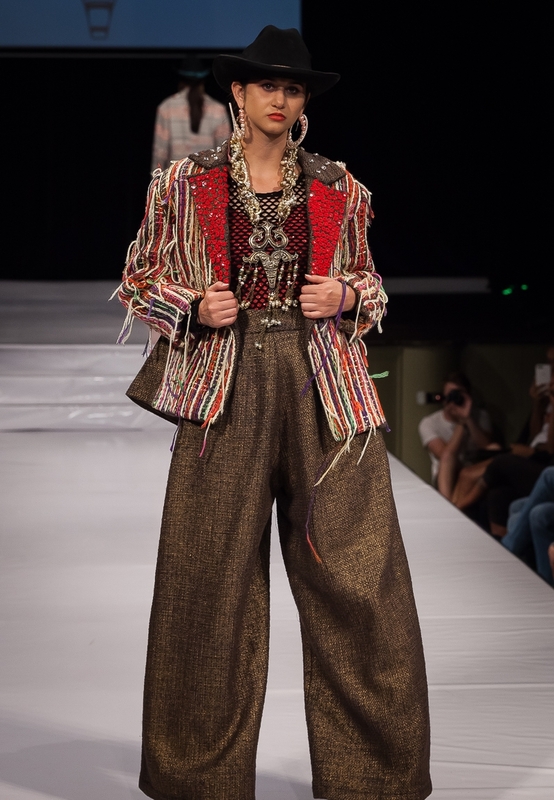 On the collection debuted during EFWA17..
"I have redesigned and incorporated the weaving of the Indigenous people who live and inhabit the highlands around the lake Toba. There is also a SIRAT (twining end) that is always used as a decorative edge of the fabric that I show as a destil and belt. Some of my Batik collection will feature sacred geometry motifs created using dyes are from agricultural waste and factory furniture waste (wood shavings) on woven cotton fabrics". Merdi Simombing for eco fashion week australia. "We are using resources faster than the earth is capable to produce them" - Sylvia in her short doucmentary. Sylvia takes used coffee bags, which with our urban culture today, are in excess - and uses theses to create unique one of a kind pieces. Up-cyling and re-use at its finest! She incorporates other materials into the designs, to demonstrate that style and sustainbaility can co-exist. Sleek design with bold pops of colour, and if you can believe it - made out of 100% recycled polyester all derived from plastic bottles. A Perth based label, made locally with sustainability at the forefront. Proving that a circular economy, taking what already exists in the world - our plastic waste - and creating new! Given we're pretty obssessed with second hand style here at tommie, this upcycling challenge presented by Marilyn Wilson was by far a stand out in the week of festivities. Such talented creations were showcased with unlikely materials and combinations creating avant garde, one of a kind bold looks. 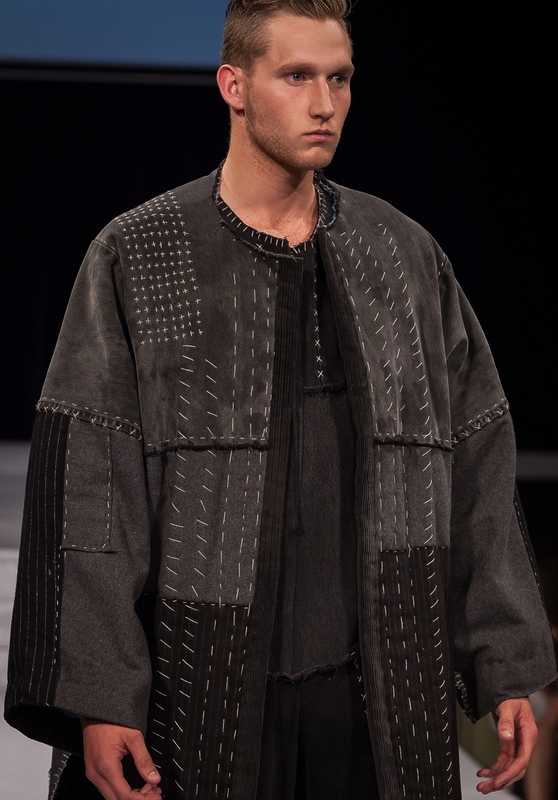 The collection 'Useless Beauty' by designer Hiroaki Tanaka showcases his experimental pieces - instead of sewing fabric together, like traditional design, he created this collection on the body by 'holding' or 'braiding' without sewing cloth and material together. He was inspired by the Japanese technique of 'Kumiko' - the art of joining wood without using nails, also known as ‘muntin’ in English. "I work with reclaimed material obtained from Op Shops. The material is brought back to life by incorporating natural mark making using traditional methods and processes to produce rich, undefined and complex works. Keeping Culture Strong – The Indigenous models (family members) that wear my designs are taught the process of traditional dyeing, so when you wear my designs you are getting a Cultural Education"
- Simone Arnol for Eco Fashion Week Australia. "#peakplastique It’s time to have a conversation with humanity about where we sit on this earth at present and how we can all do things to help the end goal of regenerating this abundant resource. When we work as part of the system we all benefit from it. Humans can make change happen, take action and disrupt the status quo. We can build each other up, value ourselves and our daily worth, by being kind to each other and the earth. Awakening to our consumer habits and the societal constructs of modern slavery. Wake up, slow down, take stock and disrupt these ideologies to transmute into a new paradigm of living on this earth, one where we heal, regenerate and live as part of the whole. I am a fashion activist and I believe fashion iterates where we sit in our current global climate. This collection embodies my zerowaste philosophy and utilises predominantly found and gathered textiles, as have all of my past collections. A continuous theme of wasted resources being made into art. Underneath is a regenerative layer like the fungi spreading awareness and communicating the kaitiakiatanga. Let’s stop trashing our planet and be responsible for our actions"
- Senorita Awesumo for EFWA17.